Kinsey Painter dresses in colorfully choreographed combinations of textures, patterns and styles, layering thrift store finds to create outfits that match her ever-changing aesthetic. A freshman at Liberty University, Painter dressed as a dad from the 80’s for Halloween. She combined high waisted jeans, a shirt printed with fishing lures, a bright blazer and a backward cap, all finds from thrifting. 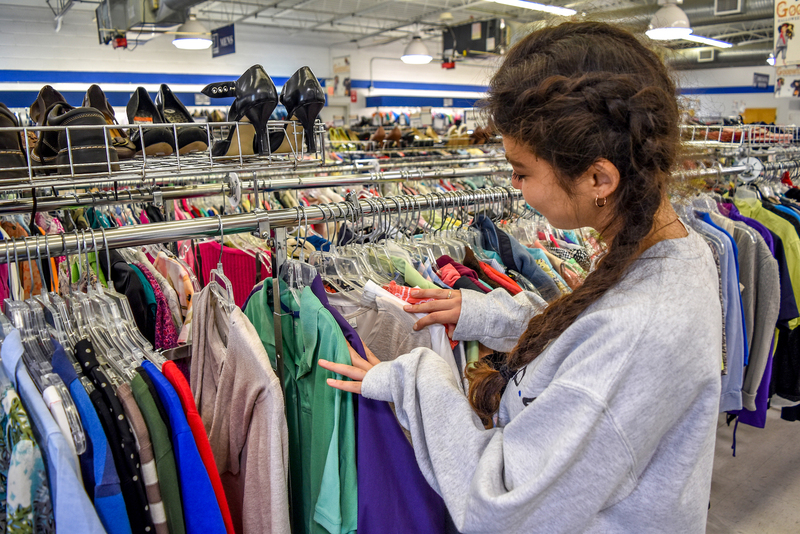 The Lynchburg area offers thrift and consignment stores ranging from the sleek and consistently stocked to mazes of back rooms packed with surprises. Options include Plato’s Closet, popular for booties and mom jeans; Goodwill, within walking distance from campus; and Thrifty Paws, which supports Amherst County’s Humane Society. Most stores add new inventory daily and offer consistent categories but constantly changing items. Thrift stores often support a charity and sell donated items which can be damaged. Consignment stores purchase gently used items, either paying the owners up front or splitting profits when the item is sold. Plato’s Closet pays for clothing up front but does not accept items older than 2 years. According to assistant manager Lauren Bunnell, this helps keep inventory fashionable. At Nice as New Consignment, under a 20-minute drive from Liberty, owner Florence Wilder sorts and prices items in a back room. A jewelry counter strewn with faux gold and bright gems greets customers arriving at the shop. Nice as New offers everything from a Batman-themed Christmas tree and board games to a rack of furry vests and purses hung in a row, lined up by color. Wilder said despite thousands of items coming through the store, she rarely sees a duplicate, and she encouraged shoppers to enjoy the search. Tyler Harrison, a sophomore at Liberty, said he can spend three hours at a thrift store and prefers to go with friends. He said the 70s and 80s styles of dress shirts he likes are easy to find at a thrift store. He also buys sound equipment, which he said is risky but worth it for the low price. Painter also acknowledged that thrift shopping requires sorting through racks of clothing for a single exciting find. But thrifting allows her to change her fashion sense often without draining her bank account. Painter’s goal is to find something she loves. She said the key to effective thrift shopping is being able to identify something and tell if it will look good on you, something she called an acquired skill. While Painter has found brands such as Ralph Lauren, Tommy Hilfiger and Dr. Martens at low prices, she focuses on the unique, touching clothing to feel its texture and looking for unusual patterns. For a new thrift shopper, Painter has simple advice. “Only buy something if you look at it and it makes you happy,” Painter said.